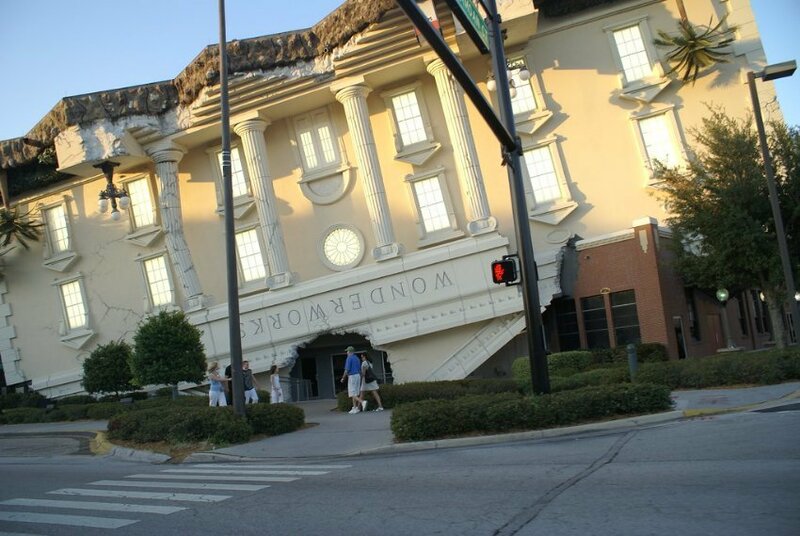 You are at:Home»Bizarre Tourist Attractions»Have You Visited the Top 8 Upside Down Houses On the Planet? Does life make it feel like you’ve been flipped upside down? For some houses, that perspective has become a reality because the house is literally upside down! There are several homes that have been given this altered perspective around the globe, so let’s explore the Top 8 upside down houses that could change your perception of reality when you pay them a visit! “The house is falling! The house is falling!” If Chicken Little saw this house, that would probably be his first reaction. Who’s worried about the sky falling when a house is falling on top of your head anyway? It’s also a common reaction that people have when they first see this upside down house in Germany. To further the perspective of a house that has fallen from the sky, it has been built on a 6% incline. With immaculate details paid to the outside of the house, including a bicycle that is also upside down, the illusion is very real! Upon walking inside the house, however, the illusion continues because everything else is upside down as well! If you’ve ever pranked someone by affixing a chair to the ceiling, this house will put any effort you’ve ever made to shame! The one downside of visiting this house is its price: Adults: €7.00, Kids are €6.00, but a family ticket is €20.00. Maybe what you need in an upside down house is more of a mansion than an actual house. And maybe, just maybe, instead of having a bunch of upside down stuff in this mansion, what you’d like to see is something more like a walkthrough of a Ripley’s Believe it or Not museum. If that’s the case, then what you’ll want to see is Wonderworks in Orlando. If it isn’t, well, you’ve been warned! Now to be fair, the entry room in Wonderworks is upside down too, but they take you through this “inversion tunnel” that supposedly turns your perspective right side around so that you’re supposedly upside down too. Once that is accomplished, you can zap your upside-down but right-side up siblings with laser tag, blow massive bubbles from a bubble sheet until you’re winded and dizzy, or use your brainwaves to control objects. A 4D motion ride and a high ropes course is also available for an added cost. General admission begins at $19.99 per person. This upside-down house is located in an open air museum, which means the intent is for you to learn something new by visiting this museum and house. What can you learn about walking inside a house that has stuff glued onto the ceiling? For starters, if you have an inner ear problem, you’ll probably not want to step foot inside of one! And if you’ve got a pacemaker? I doubt they’ll have a microwave going, so you should be fine. If these families lived in upside-down houses for centuries, it makes you wonder about their perspective on life! It’s a popular museum, so unless you get there before it opens at 9am, avoid the parking lot. Entry fee is 9PLN, but kids under 6 are free. If you really feel like making a statement, bring some acoustic instruments with you to play some folk music alongside the folk architecture for an extra special experience! More of a sculpture than a building and more of a church than a house, this upside-down tool is specifically designed to root out the evils of the world. Well.. maybe the evils that you can find in Canada, if you can even find evil there. It was initially constructed for Stanford University, but the President of the University rejected the sculpture because an upside-down church was apparently “not appropriate” for his campus. The intent of this piece, which you can see on the waterfront in Vancouver for free except for maybe having to pay for parking, is to evoke conversation. How much conversation an upside-down church creates is probably up to the individual. In reality, it’ll probably be raining when you visit anyway and you’ll just want to grab a cup of coffee, snap a quick picture, and talk about what else you’ll want to do while in Canada. Have you always thought that American politics were upside-down? In Batumi, which is located on the Black Sea, you’ll get a chance to see what politics really looks like thanks to an upside-down replica of the White House. Unlike other upside-down places, however, the White House in Batumi is actually a restaurant where you can choose to dine. The reviews on the restaurant are about average. It is huge, however, with three floors of dining rooms to meet the needs of hundred of guests. It’ll be a bit posh, a bit expensive, but I hear the walnut sauce is quite excellent! On the bright side, if you get all hot and sweaty from walking up and down three flights of stairs, the bathroom has a shower in it so you can freshen up before dessert! If you’re looking for a more realistic looking upside-down White House, then proceed to the town that everyone in Wisconsin heads to when they want to have a little fun, spend a lot of money, and get wet going down a waterslide. To get people to visit in the winter, you’ll get discounts to come see the various attractions. This White House is one of those attractions and you’re either going to love it or you’re going to hate it. There’s just no in-between! Here’s the thing about this upside-down house: it has Bigfoot in it. In jail. And then they shoot a huge cannon off when you walk by it thanks to some motion detectors that are installed somewhere. Imagine being the person working there that has to listen to it all day! It’s kind of cheesy, but that’s pretty much how you’d describe all of Wisconsin Dells, if you’re honest with yourself anyway. Invest in a duck tour afterwards, go see the actual dells out on the river, and you’ll make the trip worthwhile! So it’s got an interactive aquarium. It’s got a wind machine that will blow you with wind speeds that are equal to a hurricane. It’s got an ice cave where you can carve your name into it. It’s also very pretty when the colorful lights hit the walls of this upside-down house at night! The House of Katmandu is part of a larger themepark complex, which means you won’t be visiting just to see some upside-down stuff on a ceiling. You can also soundly defeat your children playing mini-golf, go on a 4D ride that you probably don’t want to experience right after you’ve eaten lunch, and then you can go an interactive shooting game where it’s more fun to shoot your partner than it is to shoot stuff on the screen. If you want even more interactive rides, there’s zombies in the XD Dark Ride, and who doesn’t love a good zombie attack at an upside-down house? More contemporary art than anything else, “House Attack” is a piece of conceptual art by Erwin Wurm at one of Vienna’s leading art museums. The concept behind the piece was that the house was “attacking” the museum. It’s appearance was intended to replicate a bomb that was lodged in the home because of a rogue B2 House Bomber that just happened to want to declare war on Austria. Inside MUMOK, which is the museum, you’ll find what you’d expect to see in an art museum: art. There’s also very wide rooms, extensive lighting that is very colorful, and lots of employees who tend to remind you to “Shh” when they see you because you’re shoes are squeaking on the overly waxed floor. The Top 8 upside-down houses on the planet are all unique in their own way. Some are memorable, some are memorable for maybe some not-so-good reasons, but they all have one thing in common: they’re upside-down!